« Auntie Maja’s Cooking Camp! Today I would like to share the first of a few recipes that I have made with fruit during this summer and many times in the past. These last few weeks I have had little time to work on my blog due to summer activities. Our garden, home and travel have taken time away from writing and posting, and I have to admit I truly missed it. Starting today with a not-so-sweet cherry coffee cake recipe that you can make during this wonderful season of abundance. But first a little information about the cherry…..
“The Bing Cherry is a cultivar of the wild or sweet cherry (Prunus avium) that originated in the Pacific Northwest, in Milwaukie, Oregon, US, and still remains the major cultivar in that region, and is the most produced variety of sweet cherry in the United States. The cultivar was created as a crossbred graft from the Republican cherry in 1875 by Oregon horticulturist Seth Lewelling and his Manchurian Chinese foreman Ah Bing, for whom the cultivar is named. Ah Bing was reportedly born in china and immigrated to the U.S. in about 1855. He worked as a foreman in the Lewelling family fruit orchards in Milwaukie, Oregon for about 35 years, supervising other workers and caring for trees. He went back to China in 1889 for a visit. Due to the restrictions of the Chinese Exclusions Act of 1882 he never returned to the United States. 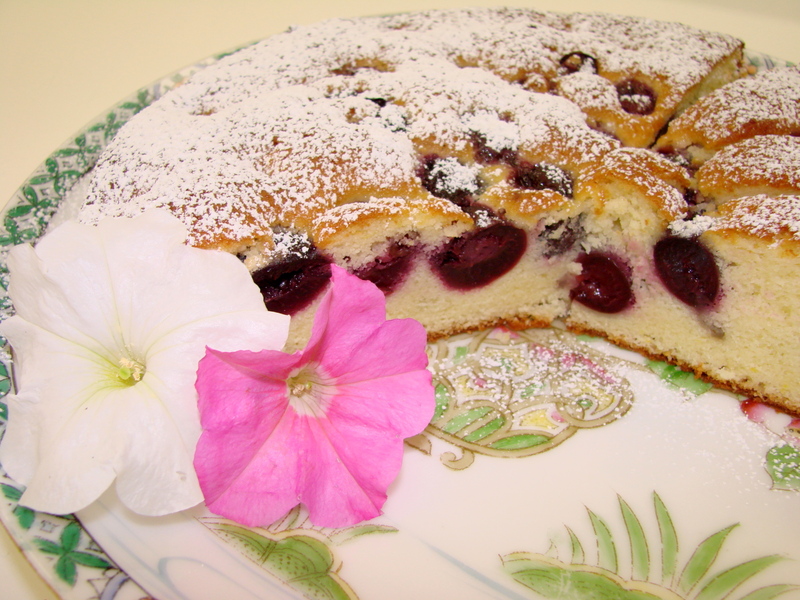 This wonderful cake is usually made with Sour Cherries, but they are not readily available where I live, therefore, I make this cake with beautiful deep red, sweet Bing Cherries. Cream butter and sugar until the mixture is very fluffy, almost white in color, this is very important. Sift together flour and baking powder and add the zest of one lemon. In a separate small bowl measure the brandy, milk and the lemon flavor. Add the flour mixture and Brandy/milk mixture to the eggs and mix gently, but thoroughly. Use two 8 inch cake pans, coat them with butter and dust them with flour. 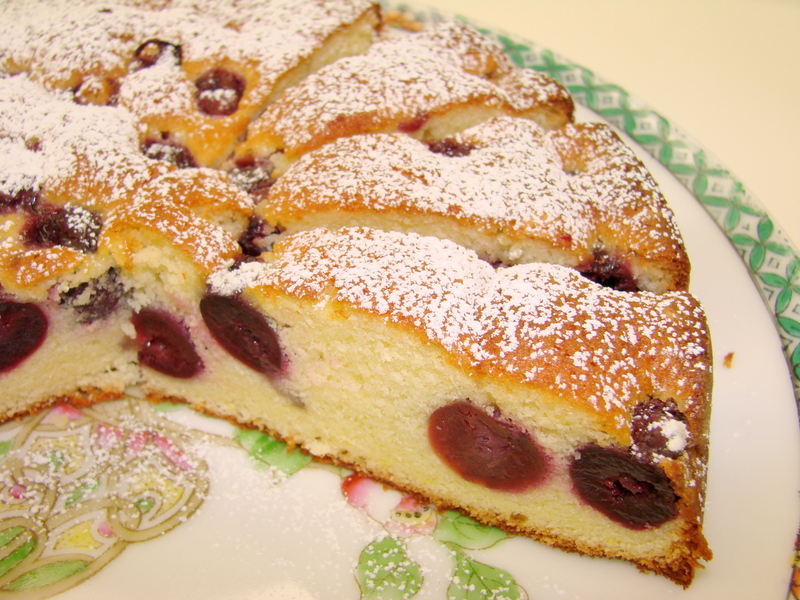 Divide the batter, pour it into the two pans and place the flour coated cherries on top of the batter. Bake the cakes at 350 F and until they are lightly browned or the cake taster comes out clean. Baking time should be around 30 to 35 minutes. 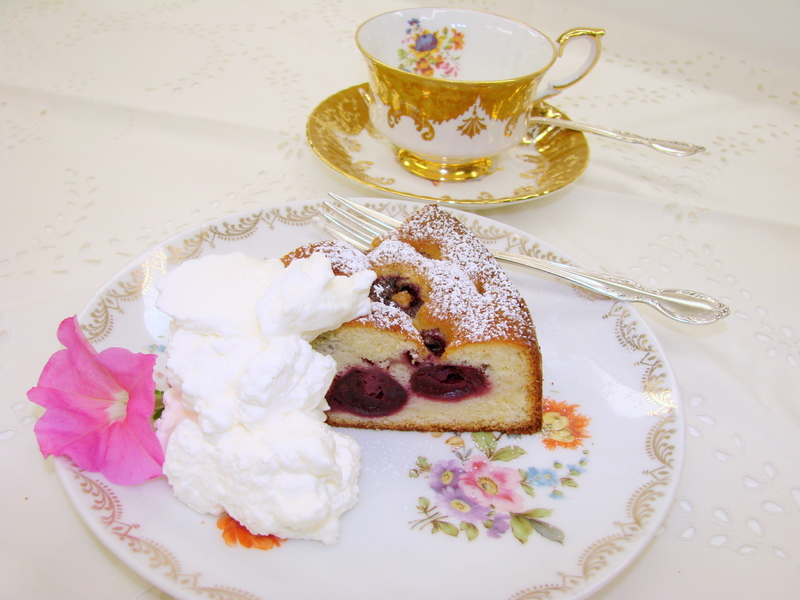 When cooled, dust the cakes with powdered sugar, add a big dollop of whipped cream….mit Schlag, to every slice when served with coffee or tea. Note: This cake can be made with other fruit as well. 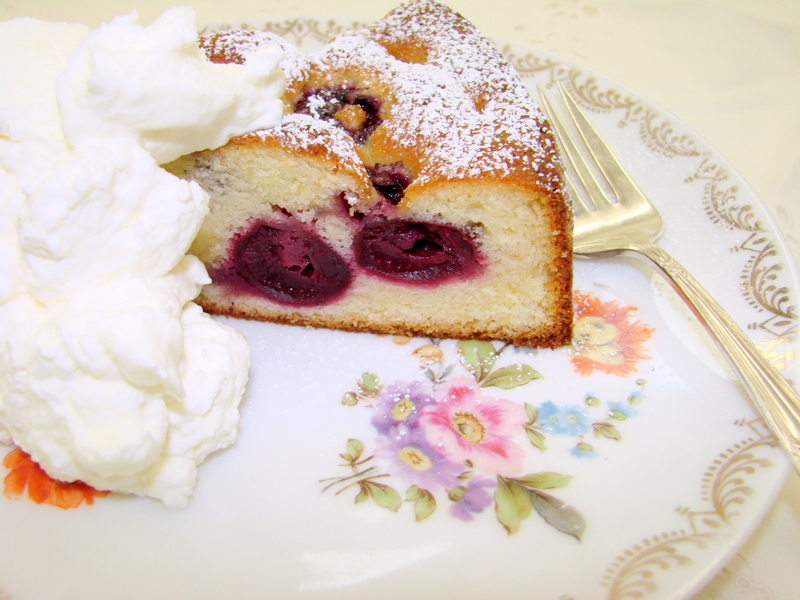 Substitute raspberries, blueberries and even grapes……..when you do not have cherries available. I would not use canned cherries…..they are simply too soft. Imagine an Austrian Summer Afternoon! you invited some friends and…. 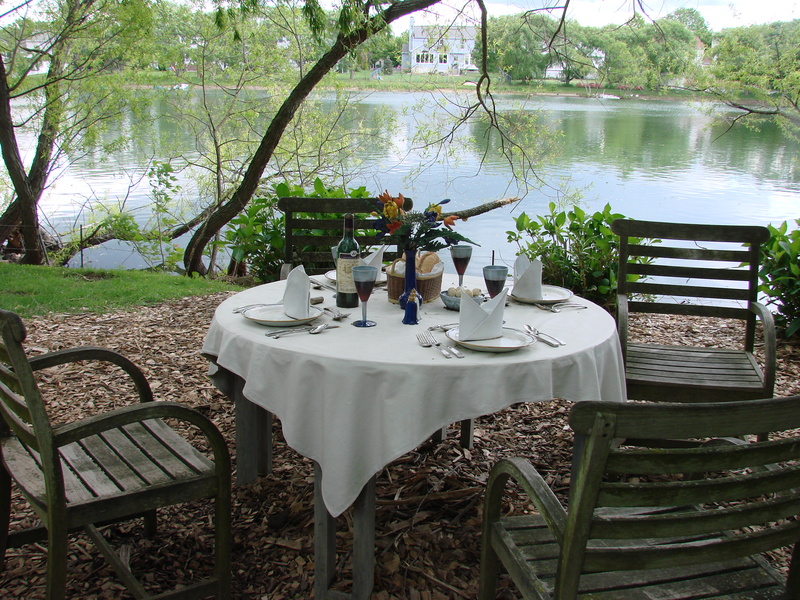 are enjoying the cool shade and the breeze rustling through the leaves…. of course….mit Schlag….with whipped cream! with slightly sweetened whipped cream. You take the first sip…………and you sigh…..
A very memorable Austrian afternoon! Jack often talks about the cherry tree in his backyard in Pittsfield. his Mom, Mary, would have loved this recipe and more than that she would have loved to share the cake and coffee with her neighbor, Blanche! Great memories and can’t wait to surprise him with this treat! 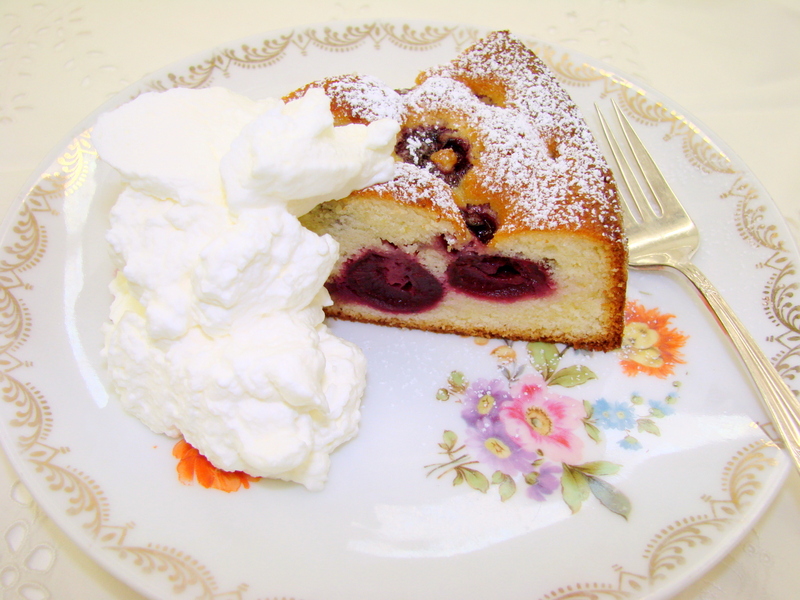 Jill….thank you for sharing a family connection with a cherry cake…….It pleased me so to hear about Jack’s cherry tree that he grew up with……. I think you will love this cake…..it is not too sweet and definitely needs a cup of coffee or tea with it…….hope you both will enjoy it…………hugs! “Oetker” Kuchen. Leider sind die Bing Kirschen hier sehr teuer. Wir hatten in Seattle mehrere Kirschbaeume und wussten gar nicht wohin mit den vielen Kirschen. Interessant zu wissen woher der Name kommt. Koennte man auch geriebene Aepfel nehmen? Hi Irene………..ich glaube gefuerfelte Aepfel waren gut……nicht geriebene…es ware aber interessant zu sehen ob die geriebenen Aepfel auch zu dem Teig gehen………vielleicht koennte man die geriebenen Apfel als eine Mittelschichte hineingeben…….man musste es mal verschiedntlich versuchen……….Du hast immer einzigartige Ideen……..I love it!!! Hi Jack…….we too had a Cherry tree in our back yard…..it was a Mother’s day gift from Charlie one year…………and it grew to be a huge tree that birds loved………..they always beat us to the harvesting day. We finally took it down, because I did not want to fight the birds every year………. We are looking forward to having you here for dinner very soon………. Hugs to you and Ann………. thank you for you nice comment…….and thank you for visiting my blog….hope to see you again next time…….hugs! I am going to try this recipe using the sour cherries that are coming in from Utah. (I am in L.A.) As long as they are available, we have preserved them in brandy and made jam. Thanks for this timely recipe…. 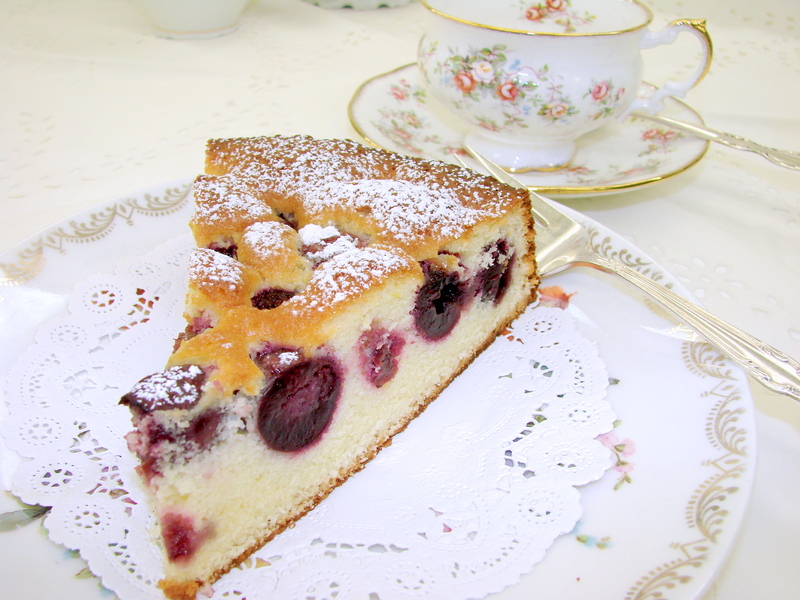 Hi Dorcas……..so good to hear from you……..and I am happy that you have the sour cherries to make this Kirschen Kuchen with……..It will be really delicious!!!!!!! 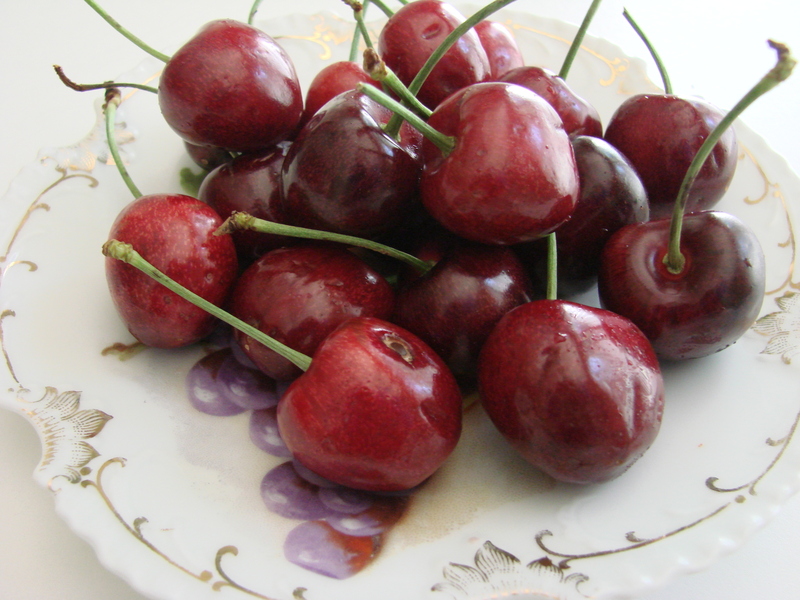 I is so much better with sour cherries……. It was soooooo delicious! Thanks for sharing. 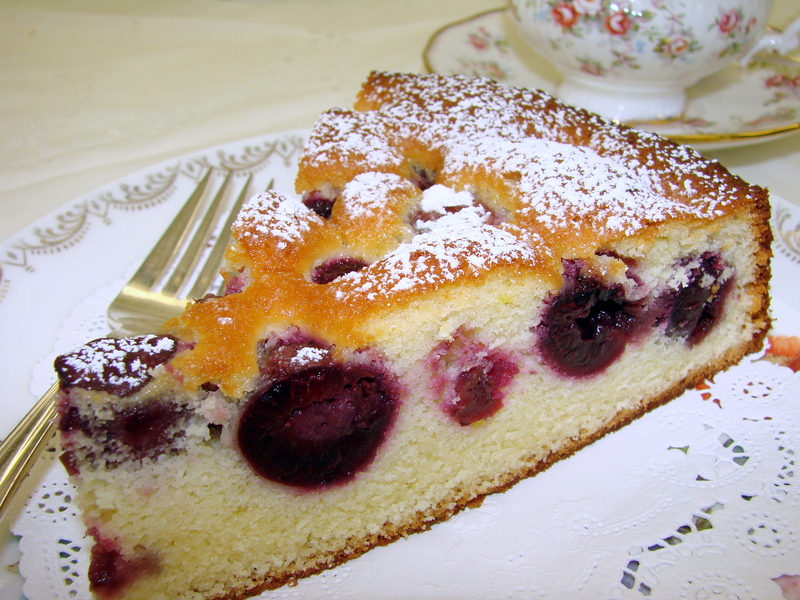 Hi Leigh…………I am glad you enjoyed the Kirschen Kuchen…….hope you make it sometimes for your family………….hugs to you! ………….I so love your posts and recipes! Thank you, Marusja……..you are my “gentlest” critic …hugs to you! A lovely post Maria! Another work of art!!! Very nice, Maria Springer. It’s a pity that getting fresh sour cherries is so difficult here. To my amazement I found some two weeks ago at Trader Joe’s and could prepare my favorite summer dessert Rote Grütze. I second that Melanie! Just beautiful Maria. oh it looks great Maria! Sorry I’m so late with this comment. Just voted 5 stars and shared to my wall. Always sooooooooooooooo bea-u-ti-ful, just like you! Thank you……..Pen…………You are so sweet!!! Love your comment and love your friendship!!! Hugs!